The number one killer of children under the age of 4 is automobile accidents. If that statistic doesn’t scare you enough, how about this one: 8 out of 10 carseats are either improperly used or installed. That means 80% of the children riding in their parents’ cars today are at risk for serious or fatal injury. You may be reading this thinking that it does not apply to you; I thought the same thing. My husband and I read the instructions, we tightened the seat belt, we assured the seat was at a proper recline. Then I had my daughter’s seat evaluated at a free safety seat check sponsored by the local fire department. I was shocked to learn that the seat was not tight enough and the recline was not where it should be. After just five minutes of going over the proper installation and fixing our mistakes, we were on our way—my daughter much safer and I with better peace of mind. Periodically tugging on the base of the safety seat to monitor its movement. Over time, these can loosen. Checking the harness fit each and every time they use the seat and adjusting it as needed. The straps are tight enough if you try to pinch the webbing but cannot get enough slack to hold between your fingers. Ensuring that straps are not twisted and lay flat against the child. Making sure that the harness straps are at or just above the child’s shoulders. If the straps are threaded through the highest slot and still fall below the child’s shoulders, it is time to move them into a more appropriate seat. 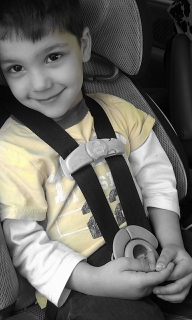 “The only way to be 100% sure that your child’s safety seat is installed correctly is to have it inspected by a certified CPST or instructor,” says Marowelli. The National Highway Traffic and Safety Administration (NHTSA) provides a 32-hour comprehensive course and requires that all prospective technicians pass both the written and hands-on end of course exams with no less than a 90%. CPSTs must also complete six hours of refresher training to ensure they stay current on updates and recalls. These professionals provide a valuable service to the community, and usually free of charge. Contact your local fire department or hospital to find the CPST nearest you. Did you know that safety seats have an expiration date on them? Most seats are considered safe to use up to six years from date of manufacture, which can be found imprinted on the plastic shell on all seats made after September 1, 2002. After that, the plastic can break down and render the seat useless for protection. If you are scouring consignment shops and tag sales looking for a good deal on a used seat–STOP! Not only is it difficult to ascertain how old the seat is, even if it is not past its expiration date, you do not know if it has ever been in an accident, something which can also damage the sturdiness of the shell. It can be expensive buying a seat brand new, but would you buy milk for your child that is past its expiration date? Why take the same chance with your child’s safety in the car? Another factor to consider, and one that was recently debated in the news, is whether or not your child should be forward-facing or rear-facing and for how long. Britney Spears faced strong criticism when pictures were snapped of her driving with her nine-month old facing forward in his seat, his head slumped over. The absolute minimum for a child to be turned forward-facing is when he or she reaches 20lbs AND 1 year of age*; however, the American Academy of Pediatrics (AAP) now recommends that children not be turned forward until they are age two and/or have reached the maximum weight limit for that particular rear-facing seat. A 2007 study in the journal Injury Prevention found that children were 75% less likely to die or be seriously injured when rear-facing. Most convertible safety seats now have a maxium weight limit between 30 and 35lbs, meaning your child may be able to ride rear-facing well past his or her first birthday. *The new MINIMUM is age two and/or have reached the maximum weight limit. Should You Give Your Child a Boost? Parents are often unsure of when they should move their child to a different seat, especially when to move them into a booster. “Parents should move their child when the child has reached the maximum weight limit for the seat, their shoulders are at or above the top slots in the seat, or the tops of the child’s ears are no longer contained within the hard plastic shell of the seat,” says Marowelli. “Unfortunately, many children are outgrowing their convertible seats before they are mature enough to sit properly in a booster seat.” If that is the case, Marowelli recommends purchasing a High-Weight Harness (HWH) booster. Some of these seats can harness a child up to 80lbs. and some, like the Graco Nautilus, incorporate a 5-point harness, a godsend for those of us with pre-schoolers too tall for their convertibles but too slim to use a regular seatbelt. Laws vary by state, but generally speaking for safety purposes, parents should not move their child out of a booster seat until the child is around 80-100lbs, at least 4’9”, and can ride in the vehicle with their bottoms pushed against the back of the seat, their knees bent and the vehicle’s lap-should belt properly positioned over their shoulder and hip bones. At no time should any child under the age of thirteen, and especially those still riding in a safety seat, be allowed to sit in the front of a car with a passenger side airbag. Brilliant post. Many don’t know the dangers involved in car seats and how easily something can go wrong if they aren’t using the right size or an old one. I love the reference to out of date milk. This is helpful to younger parents. I’m at the point that my oldest is too big for one and my daughter is in her last year of a booster. I just updated an important point in the article regarding the minimum for turning your child forward-facing. Age two is now the MINIMUM, replacing age one and twenty pounds. It is no longer just a recommended best practice!